The world of train painting is a complex and strange one, a legendary world within worlds whose core practices and atmosphere are known only to those indoctrinated within the culture it has spawned. Despite graffiti’s visual aesthetic reaching widespread mainstream appropriation and appearing on everything from handbags, TV show backdrops and….leggings, this acclaimed apex of what was previously ‘outsider art’ formed the foundation to an artform that has slowly but surely taken over the world since it’s relatively humble ‘beginnings’ in what is widely believed to be the early 70s. Whilst we can trace two distinct tangents of train writing in that of the historic marking of freights with chalk to depict their carriage weight or departure time and the subsequent artistic takes that came from it or of the modern, Bronx public transport evolved strain – it is certainly the latter that has found its permanent place within post-war modern art movements, and the one whom I’ll be providing a brief subjective analysis of. As with documenting the history of any subculture, I recognise that citing an objective history is always going to be tricky and would implore readers to do their own research. A young “short Greek-American” kid whose marker scrawled moniker of TAKI 183 is largely attributed with the beginning of what has become to be known as graffiti today (‘TAKI’ being a shortening of ‘Demetaki’, a Greek alternative to his birth name of Demetrius). Working as a courier in New York City TAKI would write his nickname on surfaces he came across – including trains – his bold and legible output more akin to commonplace childish statements and messages than the elaborate and calligraphic markings we know of graffiti writers today. However, it wasn’t until he was spurred to unsuspecting stardom after an article covering his work appeared in the NY Times in 1971 entitled “Taki 183 Spawns Pen Pals” that his work became the true catalyst for others that it had been slowly been inspiring before. Away from any political or vengeful motive for this actions, Taki 183 stated recently, when recounting his past actions that the origin for his actions, were infact that “because there was nothing else to do, and it was easy to do it. We were just killing time.” and mirroring the tactics of the election posters and stickers he had seen across New York in 1970 and Julio 204 – a little known predecessor to Taki. From 1983 to 1984 two materials were released that would indelibly change the history of modern graffiti forever with Henry Chalfant & Martha Cooper co-releasing what are now considered dual bibles of the art form with documentary ‘Style Wars’ and book ‘Subway Art’ – (both being still widely available and as revered as they were on their release). Within these early 80’s formative years train painting over wall work was the method for the message of graffiti, birthing the process of creative letterplay known as ‘Wild Style’ along with a host of other subcultural lexicon and characteristics. There the tradition of train painting being sacrosanct to graffiti became entrenched. 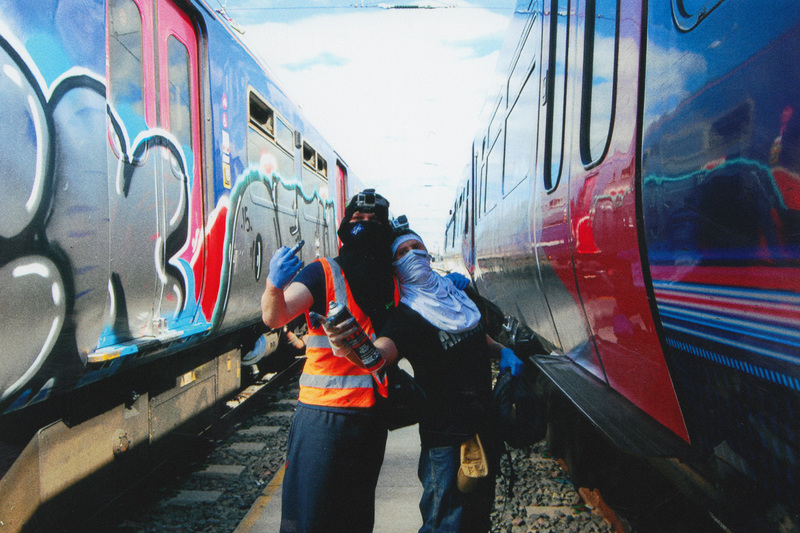 The book and film showed pioneers such as Dondi, Seen, Lee and Skeme creating pieces, styles and productions on trains whose influence to letterform development cannot be understated whilst the world would become enamored with Kase 2’s inspiring determination and colourful language. Futura 2000 took it a step further and removed these forms back to pure abstraction, producing his legendary abstract whole car, his work would later find residence under an archway in London on a brief visit to the capital. In England, these years of ’82 – ’87 saw pioneers such as The Chrome Angelz crew (led by Zaki Dee), Krash 151, Kis 42 and Set 3 begin their explorations on the rail network in London and bring a new flavour the country. The early work of Set 3, Kis 42, Coma and Tilt in ’85 being some of the first to run on the big Metropolitan line producing simple designs similar to those found before Wild Style emerged. ’86 saw Kast, Cazbee and Mise rocked some serious all colour burners on tubes and Drax met Robbo, forming a friendship with a writer who would go down in history as one of the greatest. Just as the stylistic traditions of modern American graffiti were created due to constraints of painting on trains, so too was what has come to be termed ‘London style’. With the now legendary DDS crew being formed in 1991 by Shu2 and Sub One the cities rail network saw the solidification of a style that acts a defining characteristic of the capitals writers worldwide. A far cry from the colourful and ‘flowery’ work of The Chrome Angelz that saw their work appear on The Lenny Henry Show London style is simple, aggressive, predominantly legible and defined by its use of chrome and black paint, being epitomized by writers like Diet, Teach, Fume and the unmistakable Zomby. During 1991, Paris saw the release of a book that Sowat DMV cites as as influential to Parisian artists of that generation as Subway Art was – ‘Paris Tonkar’. Collecting the development of graffiti in the French capital between 1987 and 1991 it provides an insight into the beginnings of what is now hailed as one of the most innovative and progressive scenes on the planet. Styles on the Metro during this time were reminiscent of Subway Art-era pioneers with DEA and STEM popping up respectively throughout the Metro sections alongside worked from TCA member MODE 2 whilst Nasty continually changed up names. Despite this contemporary style train writing still stays true to its roots with mainland Europe having a huge and desirable scene where train writing still plays a huge part in the culture. This repetition does not mean stagnation though, with German ‘duo’ Taps & Moses (primarily known for their work on trains) now developing a distinct contemporary practice more suited to the art world than graffiti, where obstructive installations within carriages (‘The Wall’) play on the intrusive and antagonistic attitudes that graffiti thrives on. This playfulness and willingness to push traditional conceptual boundaries is matched in Paris’ famous PAL crew and the bizarre work of Swiss-Solvenian artist duo Veli and Amos who – unable to find a parallel to what has pictured in ‘Style Wars’ in their rural city of Maribor, simply wholeheartedly recreated them with whatever materials they had to hand – including local trains. This culminating in the release of ‘Style Wars 2’, a self funded, entirely unofficial sequel. Waiting patiently on your platform amidst the daily grind remember that someone, somewhere see’s these mechanical behemoths and the environment around them as opportunities, possibilities un-ending into an existence so full with colour, vibrancy and danger that no prison can hold it. Join in.